There are conflicting stories and information behind Mikao Usui and the founding of Reiki, but based on the research of my Reiki Masters, and information passed down to them by theirs, here is the history as we know it to be. Born as a Buddhist monk into a Japanese samurai family in 1865, Mikao Usui went on to study many religions and belief systems. While teaching, his students once asked him why they had never been taught any healing methods that Jesus had once shown his own students — Usui didn’t have the answer. He decided to go on a journey to gain knowledge. It’s said this led him to America, Europe and China. He researched many texts for the answers around hands-on-healing. Usui was able to read Japanese, Chinese and Sanskrit. Mikao Usui also is said to have traveled to North India where he began to study the Holy Writings. Upon returning to Japan he discovered some Sanskrit formulas and symbols from the old Buddhist Sutras which provided him with the answers. Through meditation — which he had been practicing most of his life — based around what he had discovered with the Sutras, what is now known as the system of Reiki was revealed to him, including the symbols used within Reiki. The Japanese translation for the word Reiki means spiritual, or sacred, energy. Usui Reiki represents the universal life force of energy. It is known as an activator, releaser and transformer of subtle energies. It can bring harmony, wholeness and balance. The energy is a facilitator for spiritual connections and enlightenment. Reiki is a hands-on-healing method and can be used on people, pets, trees, plants, crystals and so much more. It is also very useful to bring forth positive healthy energy into the home, or even nature, replacing negative and any energy that doesn’t belong. Reiki has been known to help with pain relief, increase healing of wounds, aid with chronic or acute illness, strengthen the immune system, de-stress and calm the mind, enable clarity, stimulate the right brain, balance one’s feelings, ease depression and insomnia, help stop addictive behavior and fear based conditions, boost self confidence, clear the energy in the body and aura, stimulate intuition, provide an enhanced sense of connectedness and oneness, and soothe and nourish the soul. Hawayo Hiromi Takata is the third Reiki Master in everyone’s lineage today. She was trained in Reiki by Dr Chujiro Hayashi, who learnt Reiki directly from Mikao Usui, the founder of Reiki. While Takata was born in Hawaii, she was trained in Japan and is sometimes referred to as the Reiki Grand Master Teacher. 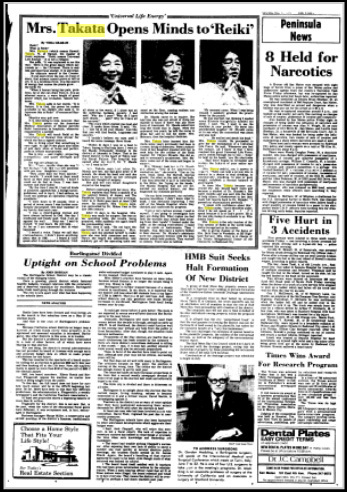 On may 17th, 1975, an article based around an interview with Takata was published in The Times newspaper in California, USA. This interview helps to provide additional insight into what Reiki is really about. It is interesting to note, however, that Mrs. Takata points out the American Medical Association of Hawaii permits Reiki treatments in hospitals, whenever requested by a patient. Mrs. Takata will teach Reiki at the University of Hawaii this winter, for which she has a signed contract. She is living proof that something is very right. At age 74, she plays nine holes of golf daily when at home, and participates in 18-hole tournaments. She is tiny — and mighty! Projecting tranquility and quiet strength and power. She was not always so. Mrs. Takata says that when Dr. Maeda saw her, she had gone down to 97 pounds. He shook his head, and said she would have to build up her strength before any thought of surgery. She and her two small daughters stayed at the hospital. Before continuing with her story, Mrs. Takata explains that Reiki is spoken of in the ancient history of Japan, and in the Buddhist Sutras, the sacred writings refer to it. Reiki goes back at least 2,500 years. Its mystery, Mrs. Takata says, was unraveled by Dr. Mikao Usui in the late eighteenth century. After twenty-one days in the hospital, Mrs. Takata was ready for surgery. She was on the operating table, she recalls, being prepared, when suddenly she again heard the commanding voice. This time, it said, “Do not have the operation. It is not necessary.” Mrs. Takata said she pinched herself, to make sure she was both conscious and sane. Thrice she heard the admonition, and suddenly got off the operating table and stood on the floor, causing endless consternation among the nurses. Dr. Maeda came in to inquire. She told him she was not afraid of dying, but wanted to know if there was any other treatment. Dr. Maeda asked how long she would stay in Japan. When she answered, two years, he told the nurses to dress her, and to call his sister, Mrs. Shimura, who was then the hospital dietician. The Maeda Hospital is where they checked and confirmed my progress. In time, Mrs. Takata became convinced that she, too, should learn more and became a student of Dr. Hayashi. She spent months, and was sent into the field to help others. Unbeknownst to her, they made full reports back to Dr. Hayashi. “I passed my examinations perfectly.” Besides the treatments, she adds, there was a matter of special diets, some including sunflower seeds, red beet juice, grapefruit, and almonds.